Still with us? Of course you are! Because you know there’s still plenty of LinkLove goodness to be had. 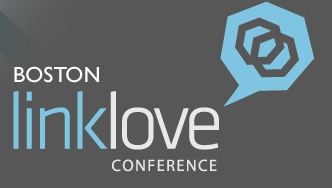 One of the things we’re doing at LinkLove is building relationships. That’s true of any conference. As great as liveblogging can be for those who are unable to attend, it’s not a true replacement for being there in person, hearing the speakers, and meeting the other attendees. The same can be said of link building. While there are plenty of impersonal methods to employ for building links, some of the better links will come from building relationships first. Wil Reynolds shows us how. As Duncan introduces Wil, he mentions that one person who used just one of Wil’s tips from SearchLove last November generated more than $1 million in revenue. Just from that one tip. Are you paying attention? Then let’s go! Wil’s going to teach us how to become link stalkers. He says if he’s invited to come back next year, he’s going to ask how many people have implemented his suggestions. If the number’s too small, he’s going to give the exact same presentation. Think he’s kidding? Try him. He’s liveblogging his own session from PowerPoint. As he advances, it will automatically update his twitter stream with his links. Awesome. The Web is full of content you can easily scrape or access via RSS. This plugin will show you where all the valuable RSS feeds are as you surfing. Wil looked at who was influential, who he wanted to follow him, but wasn’t following him. Dharmesh Shah, for example, doesn’t follow him. Wil plans to change that. So part of stalking is figuring out how you can offer value to the people you want to follow you. iGoogle is one of the easiest things you can set up. It’s not advanced. You should do it, and if you don’t, he’ll break your fingers because you’re obviously not using them. And then Wil breaks out his trademark—JFDI. https://bit.ly/igoogle-todos You also need to install this plugin on Chrome. He found a way around the Twitter feed block. All blogs have RSS, and it’s easy to add to iGoogle. If you don’t install the first plugin he mentioned at the beginning, and you don’t know there’s an RSS feed, you’re missing out on all kinds of data all over the Web. You can set up Quora stalking, too. And he found an RSS feed for Gmail, which he had no idea existed. Again, bring it into iGoogle to follow everything in one place. Look at the question they’re asking, and answer them. That’s how you create relationships with people. When you’re stalking someone, you see the questions they ask, so you can help them find the answers. Look at who they’re following, and try to be a little more like them. If you talk about Snooki all day, do you really think Dharmesh is going to follow you? Probably not. So how do you know what the profiles of the people he follows are like at a glance? https://bit.ly/free-follower-export, that’s how. Then take the bios of the people Dharmesh (or your target) follows, and see what they’re talking about. Then look at your Twitter bio. Does it match up with those people he’s following? If not, maybe you need to make some edits. It’s not changing who you are. It’s like putting on makeup. You’re not changing fundamentally who you are, you’re just adding a little blush and mascara. What to get in tech news? Meeting people in real life works, and there’s a strategy for that, too. He searched Twitter bios on followerwonk for columnists in Philadelphia. Do the same where you live, then stalk them. He found a columnist for ReadWriteWeb who lived in walking distance of the SEER Interactive offices, and the guy already followed him. Now that you’ve identified the person you want to connect with, go have coffee with them. Stop being scared to meet people and talk to them. You’re at a conference. Why are you talking to people you already know from work? If they could have given you a link, they would have already. You have to meet people! When is your mark coming to you? Wil set up a Twitter search to let him know anytime Dharmesh searches for Philadelphia. So when Dharmesh asks who has the best cheesesteak in Philly, guess who’s there to answer him? And then Twitter took that away. So f#$% them. Use Topsy instead. Stalkers don’t stop stalking! You can set up the same thing in Topsy. Wil calls this the Mona Lisa. You can swap Philly out for anything, and you’ll find out when your target is asking about that topic. When the person you’re trying to connect with talks about something you have expertise about, you need to be on top of that. If you want to be really good at this, you do IfTTT. Remember, it’s RSS—Really Simple Stalking. Wil has iGoogle set up to receive a text message when Dharmesh mentions Philly so he can respond right away, or any other area of expertise like beer, linking, or SEO. Don’t think you don’t have time to do this. You can do it over the next break. Let’s keep rockin’. Wil’s not a coder. He barely knows HTML. So this part is for the Excel junkies. Enable the developer tab. He doesn’t have instructions, so just Google it. Then click on XML maps, and it brings up a box. You click “add” and you can enter an RSS feed for the URL. Who knew?! Then you can bring in the title, link and description of every RSS feed. If you use SEO Tools for Excel, you can bring in Tweets, you can scrape, there’s a lot you can do in Excel that others are doing in Google Docs. So he identified another person he wanted to get to know, Miranda Miller. He started stalking her on Quora. When she asks a question, he can answer it. But if he doesn’t know the answer, he can retweet the question, and maybe someone in his network can answer it for her. Wil says he’s a stalker, but he’s also lazy. So he needed to find an easy way to find the Twitter feeds for the people he wanted to follow. On Mozenda, you enter the URL, you click an author, and then create a similar list. Then you select that person’s profiles, you instruct Mozenda to scrape them, and drop the information into a CSV file. Another thing you want to know is, who do they follow that you already know? Check Facebook. Who do you know in common? Faces make it easer. You can also use followerwonk on this. Pull in all the GA referrers, and then pull in the SEOMoz data on them. At this point, Wil shows another Excel spreadsheet. I’m going to highly recommend you get your hands on his presentation if you can. Remember—more than $1 million in revenue from just one tip. Find it. Get it. Use it. https://bit.ly/moz-data will show you how to find the people who are sending you traffic. Fake it ’til you make it—buy followers. That’s not something he’d normally recommend. But he talked to someone who bought 2,000 followers, and then more people started following her. It’s sad. We need to stop looking at that as a reason not to follow someone. Look at the value of what they’re sharing. Add a + to the end of every bit.ly URL, and it will show you how far that information is traveling. You want proof? It was three Saturdays ago that Wil started stalking Dharmesh. Finally, Dharmesh followed him back on Google+. He’s still working on Twitter. If you need followers, check out Inboxq.com. It sends questions you have expertise in to your inbox. If you’re a Hootsuite person, there’s a tab just for this. Start helping people. Start answering their questions. You’ll be surprised at how many people follow you back. If you think this presentation is about building links, you’ve missed the entire point. If you try to understand people, understand what makes them tick, and if you are there to help them when they need it, you make friends. Some people call it stalking. That’s fine. It’s a marketing tactic. But it’s really helping. The worst case scenario is that you just make a bunch of friends instead of links. Wil says he’ll take friends over links any day. Good advice.